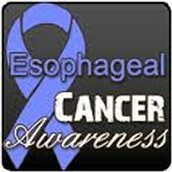 Esophageal Cancer is cancer in the result of uncontrolled growth of cells located in a particular part of your Esophagus. It occurs and starts in your Esophagus. There are two forms of Esophageal cancer Adenocarcinoma which is caused from long term Acid reflux. The other type of Esophageal Cancer is Squamous Cell Carcinoma. Which begins in flat cells lining the esophagus. There is also no way to discover an accurate number of people that have esophageal cancer because some people have it so low in the esophagus that they consider it to be stomach cancer. However, the estimated amount of people in the U.S. that got a new case this year is 17,990 and the estimated deaths are 15,210. What are the Symptoms? How to Prevent? With Esophageal Cancer the symptoms don't really occur until the cancer is developing more. But after words when the cancer is there and active you can suffer from quite a few symptoms, Such As; Difficult or painful swallowing; Severe weight loss; Pain in the throat or back, behind the breastbone or between shoulder blades; Hoarseness or chronic cough; Vomiting; and coughing up blood. There isn't really anyway to prevent this other than avoiding controlable risk factors. But one way to help is to have a high diet of fruits and vegetables, because the vitamins and minerals in them. 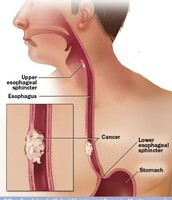 Where and Why Does Esophageal Cancer Occur? What are Risk Factors? 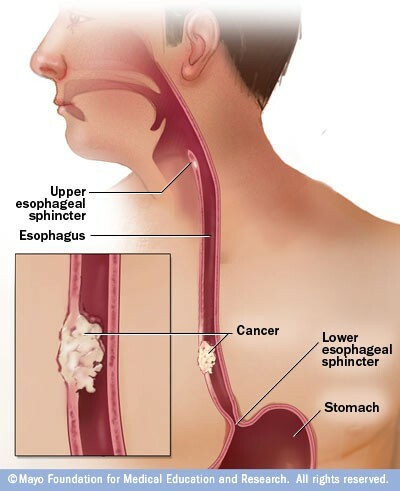 Esophageal Cancer can go anywhere along the Esophagus, it usually occurs on the inner cells that line inside of the Esophagus. In America it's most common area of the Esophagus to get cancer is in the lower Esophagus, also more men get Esophageal Cancer than women. Some of the Causes or Risk factors are high uses of Alcohol and or tobacco products, such as Smoking. 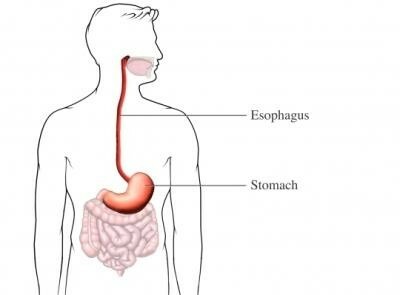 When the Esophageal Cancer starts to develop it usually starts on the inner walls of the Esophagus and works it's way out into thicker parts of the Esophagus. In order to be diagnosed with the cancer there a few different possible methods you could do, One of the things you can do is Physical Exam and History, Chest x-ray, and Barium Swallow, and Esophagoscopy. Two treatments are Surgery and Chemo Therapy.